Our eyes are our window to the world. Yet about 14 million Americans ages 12 and older have visual impairment—but 80% of those problems could be corrected through the use of glasses or surgery. Vision loss plays a role in many other health conditions, including type 2 diabetes, depression, stroke, hearing loss and chronic kidney disease. It is also tied to increased risk of falls and injuries and even early death. For children, early eye health care is often coordinated by a pediatrician, with referrals to other providers as needed. Eye screenings should be done at birth, and then during well-child exams at 6 months, 1 or 2 years of age, 3 or 4 years of age and annually after age 5. Adults who already have glasses, contacts or other diagnosed eye conditions typically need an annual exam, but should follow the recommendations of their eye care provider. For adults without glasses, contacts or other eye conditions, it’s recommended to have a baseline screening at age 40, but people with diabetes, high blood pressure or family history of eye disease may need earlier screening. Adults ages 65 and older should have their eyes checked annually. 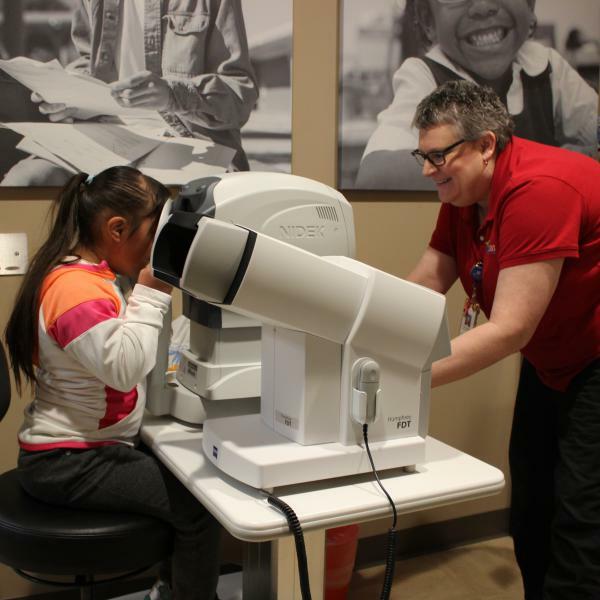 At Interact for Health, we recognize that vision care is critical for children served by our school-based health centers. We continue to work with partners to ensure that local kids have access to vision care, either directly at their school or through referrals. Being able to see clearly can affect a person’s ability to be productive at school or work. A guide to local vision care resources is available through the Vision Coalition of Greater Cincinnati at www.vcgc.org or by contacting the Cincinnati Eye Institute Foundation at 1-866-466-2343.